to be a nuisance by a County Judge. Updated: June 28, 2017 - Many jurisdictions in the Western US have “burn bans” that disallow the use of wood or pellet stoves when air quality is very poor, often in conjunction with weather inversions. Nuisance regulations, on the other hand, apply when one person is creating excessive smoke that bothers an immediate neighbor. That person may be using an EPA certified stove, an old stove or an outdoor or indoor boiler. The purpose of this paper is to show the range of standards by which excessive smoke is measured. Lack of resolution between neighbors is all too common, due sometimes to a lack of a clear nuisance standard for that town or county, or simply due to a lack of the ability or willingness to enforce a nuisance standard. Sometimes, standards are less important than the discretion and findings of a local health official. In Massachusetts, for example, a City Commissioner of Public Health has wide discretion to order someone to stop burning wood, as a Commission did in June 2017 after local residents complained of smoke from a restaurant. The 6-page decision found that a $65,000 scrubber performed poorly and ordered the owner to stop burning wood and charcoal. If a jurisdiction has no written standard or regulation and does not allow the kind of discretion a health commission in Massachusetts has, the sample provisions below offer an excellent starting point for the jurisdiction to adopt. Most jurisdictions use "opacity" as a measure of smoke - meaning the ability to see through it. An opacity of 20% or lower is often listed as acceptable, but not always. In some regulations, a specific amount of start-up time is exempted, ranging from 6 to 20 minutes in these sample regulations. However, many wood stove experts say 20 - 30 minutes is often the time needed to get a fire without visible smoke. The Ringellman chart or scale was developed in 1888 and is still sometimes used and referenced today. The Ringellman scale was adapted by the US Bureau of Mines. The Alliance for Green Heat has noticed an increase in complaints about wood smoke. We know that in many cases excessive wood smoke results from burning unseasoned wood, caused in part by the shortage of seasoned firewood this year. Too many people with wood stoves wait until the fall to order wood and too many firewood distributors try to pass off unseasoned wood as seasoned. The proposed ban of stoves in Utah has also brought the issue of “responsible burning” to the forefront, with industry calling for EPA certified equipment to be exempt from any ban. These nuisance provisions, with a few exceptions, make no distinction between the kind of device that is being used, and focus solely on how well the operator is using it. No person shall cause or allow the emission of smoke exceeding twenty-percent opacity from any flue or chimney, except for a single fifteen-minute period for cold start-up. Any emission in excess hereof is hereby declared to be a nuisance and is prohibited. A person who operates in a densely populated area an outdoor wood-burning device that produces visible emissions, measured as any opacity, totaling 12 minutes in any hour that cross onto land or buildings immediately adjacent to a dwelling or commercial building not owned by the owner of the outdoor wood-burning device creates a nuisance. Massachusetts Department of Environmental Protection (MassDEP) regulations limit visible smoke (or "opacity") and prohibit air pollution that places people at risk, interferes with property uses, threatens natural resources, or creates nuisances, such as excessive odor and soot. * Existing sources outside special control areas. No person may emit any air contaminant for a period or periods aggregating more than three minutes in any one hour which is equal to or greater than 40% opacity. * New sources in all areas and existing sources within special control areas: No person may emit any air contaminants for a period or periods aggregating more than three minutes in any one hour which is equal to or greater than 20% opacity. * A nuisance is anything which is injurious to health, indecent, offensive to the senses, or an obstruction to the free use of property, so as to interfere with the comfortable enjoyment of life or property. A nuisance may be the subject of an action. No person shall cause or allow a visible emission from any wood-burning device in any building or structure that exceeds No. 1 on the Ringlemann Chart or 20 percent opacity for a period or periods aggregating more than three consecutive minutes in any one hour period. Visible emissions created during a fifteen-minute start-up period are exempt from this regulation. * Certified wood heaters may be operated during a no-burn period provided that no visible emissions are produced after a twenty (20) minute period following start up or refueling. * During a period in which the Director has not declared a no-burn, no person shall operate a solid fuel heating device in a manner which produces emission into the atmosphere if the emissions exceed 30 % opacity twenty (20) minutes or longer after ignition or refueling of the solid fuel burning device. Visible emission opacity shall be determined by an observer certified by the Director. Smoke shall not exceed an average of 20% opacity for any 2-minute period during an hour or average of 40% for 6 minutes after start-up. The emission into the open air of visible smoke from any residential indoor non-wood pellet-burning appliance or any non EPA-Phase II certified wood burning appliance or fireplace used for home- heating purposes in such manner or in such amounts as to endanger or tend to endanger the health, comfort, safety or welfare of any reasonable person, or to cause unreasonable injury or damage to property or which could cause annoyance or discomfort in the area of the emission, is prohibited. * During a green or yellow advisory, no person in charge of property shall operate or allow to be operated a solid-fuel space-heating device which discharges emissions that are of an opacity greater than 40 percent. This provision does not apply to the emissions during the building of a new fire, for a period or periods aggregating no more than ten minutes in any four-hour period. * Upon a determination that a person has violated section 6.255 of this code, the city manager may impose upon the violator and any other person in charge of the property, an administrative penalty not greater than $500. * After the first 15-minutes of start-up, smoke from the chimney must be at or less than 20% opacity (smoke should be barely visible looking at it with your back to the sun). * Violation of City Code can result in a summons to appear in municipal court resulting in a fine of up to $1,000 and 180 days in jail. No person may operate a solid fuel-fired heating device in such a manner that visible emissions reduce visibility through the exhaust for more than 15 minutes in any one hour by 50% opacity or greater. * No person shall discharge into the atmosphere from any source of emission whatsoever any air contaminant greater than 20% visible opacity as determined by Test Method described in subsection A, for a period in excess of six (6) minutes in any consecutive sixty (60) minute period. * Any emissions from portable, stationary, or motor vehicle sources in excess of 40% opacity, regardless of length of time, are considered excessive emissions. * State law limits the density of smoke from indoor fires to ensure that people use clean burning techniques. This requirement is called the 20 percent smoke opacity limit. Opacity means how much your view through the smoke is blocked. * 100 percent opacity means you can't see anything through the smoke. 20 percent opacity means there is very little smoke and you can see almost perfectly through it. If you use dry enough fuel, the right equipment, and give your fire the right amount of air, there should be no visible smoke from your chimney or stove pipe--only heat waves. • Starting the fire. You have up to 20 minutes every four hours. • Stoking the fire. You have up to six consecutive minutes in any one-hour period. This post presents another example of why wood heat is anything but "green." The blog post seems to suggest that smoke pollution is somehow okay if it is below what wood burning industry supporters consider "excessive." What they really need to understand is children and their families, - everyone - should be able to breathe air free of any amount of toxic wood heat pollution. They must not be expected to put up with it until it becomes "excessive." The so-called "20%" opacity level shown in the first picture should be considered unacceptable in a residential area - and so should any amount of wood smoke pollution above zero. Hopefully as clean renewable energy sources develop further they will soon make the harmful practice of residential wood burning obsolete. Burning wood is far FAR cleaner than the radioactive fly ash coming out of coal power plants, and is still far cleaner than Fracking which contaminates ground water like crazy. Its also cheaper, which helps low wage family's and is reliable. People have burned wood for heating since the dawn of mankind. Its a key to our civilization and without it we would all be living in wigwams, heck, probably tree's. Furthermore, the amount of "pollution" wild fires, which are a naturally occurring and necessary function in nature, emit FAR more pollution than all of human wood burning combined for the last decade. Your air is clean, you may not think its clean. But it is. In China, the rivers are blood red, 75% of the native inland aquatic species are extinct, the sun doesn't shine AT ALL for days or weeks at a time, and people have to wear respirators 24/7. But guess what? China has jobs, and we dont. But at least we will have clean air, right? Not that future generations will be able to enjoy it, because America will be a third world country thanks to people such as yourself. Just like Africa, clean pristine natural environment, and nobody there can ever enjoy it because they live on less than 50 cents a day. 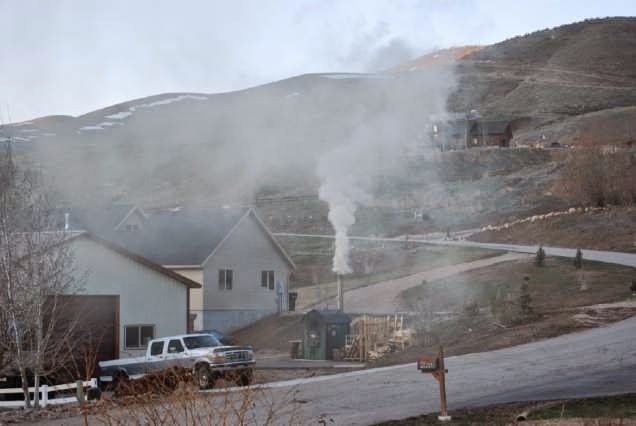 What really gets me is why would any wood stove, even EPA approved, be so special that in crowded areas with access to gas, burners are allowed to put out so much particulate, from whatever, 1000 to 1 or all the way down to 10 to 1, as compared to a gas furnace. Why are wood burners so special that those who can easily afford gas are still allowed to burn wood? And the rest of us are using gas and paying for all the health costs while burners get to pollute? All those examples show how weak current regulations are. We need better, more effective laws, and in many areas prohibition. The OWB being used in this picture was an older model and not up to the recent EPA certifications. The man using it didn't care how it affected his neighbors. He didn't care if it made his neighbors sick. And when told it was making his neighbors sick he said he didn't care and burned more and more frequently. He was a bully burner, and all he cared about was saving a buck. Innocent people should be protected from people like this one. The problem with using opacity as a smoke measurement technique (in addition to the training needed to judge 20% from 40%) is that measurements must be made in a portion of the plume where there is no condensed water vapor (steam). On cold winter days (0 F or below), a typical wood stove plume is nearly completely obscured by steam, making opacity measurements impossible. There is a need for better measurement methods. Interesting how many places have the caution that wood smoke should NOT be a nuisance to others. Obviously this is a complaint based system which thus puts the responsibility on others not the wood burners to complain, allowing the whole issue to fester needlessly. In matters of health, officials should demand best technology, and sorry, wood just doesn't meet the standards in crowded areas. Rural places, who cares!